Browse through hundreds of pieces of Silver Celtic Jewellery. This beautiful array of Celtic Jewellery has been made by great Irish craftsmen in Ireland. The collection was inspired by the Celtic era, where faith was a prominent part of life. This famous era paved the way for superb craftsmanship in areas such as art and crafts. The popularity of the patterns increased enormously throughout the 21st Century and now it has been incorporated into giftware, homeware, art and jewellery. Many people wear these beautiful pieces to celebrate their ancestors, or to commemorate a loved one. This extensive collection has everything that you need. The array of sterling silver Celtic jewellery includes ladies Celtic necklaces, mens Celtic necklaces, Celtic Crosses, Celtic Bracelets, Celtic Cuff-links, Celtic Earrings, Celtic Warrior Jewellery, the Children Of Lir collection, Tara's Diary Collection, Claddagh birthstone rings and the House Of Lor collection. All items are hallmarked in Dublin and made in Ireland. There are many Celtic inspired designs showcased on the item including the Claddagh Symbol, the Tree of Life design, the Trinity Knot and the Shamrock. If that wasn't enough, we also have emerald stone set Irish jewellery and faux stone set rings. Many of the items have two-tone gold and silver. We have something to suit everyone's taste and style. Claddagh Jewellers are dedicated to bringing you the most loved Celtic Jewellery. We provide excellent customer service before, during and after you purchase. 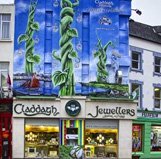 We have made and shipped thousands of pieces of Irish jewellery all over the world. You may also be interested in our Gold Irish Jewellery Collection.